Jica Co is a producer of large high density polyethylene (HDPE) fittings, tanks, and manholes. Our manufacturing process, combined with our machining capabilities, enables us to provide our customers with a wide variety of HDPE product configurations. Products are manufactured by extrusion method using state-of-the art German-made equipment and technology. All pipe fittings are machined from a single piece of HDPE cylindrical billet. 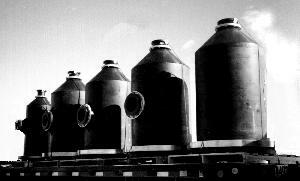 Tanks and manholes are extruded as a continuous, seamless cylinder using the same process. Only HD PE3408 material with a cell classification per ASTM 3350, meeting the requirements of Standard Specification for Polyethylene Plastics Molding and Extrusion Materials, ASTM D 1248, type III, Class C, Category 5, Grade P34, is used in the manufacture of our products. All fittings meet or exceed current ASTM standards and can be made to customer requirements and specifications. In addition to our standard machined fittings, Jica Co is capable of machining parts up to 12 feet in diameter and six feet in length/height. This enables us to custom design and manufacture unique and specialized items. This document was designed to acquaint you with our products and manufacturing capabilities. For more detailed diagrams, charts and dimensions, please request a product field manual using the Request for Information link. Jica Co © 2008-2019. All rights reserved.